Namibia's Big Brother Africa winner Dillish Mathews was seen kissing an unknown man in a new photo that has emerged. The beauty queen who won Big Brother Africa Season 8 'The Chase' might have a new crush, she was actually rumoured to be dating Nigeria's Flavour at one point (she exclusively revealed to Pulse TV that they are friends) shared a picture of her about to kiss a lucky man. Well, not to worry guys. Dillish hasn’t been taken yet. 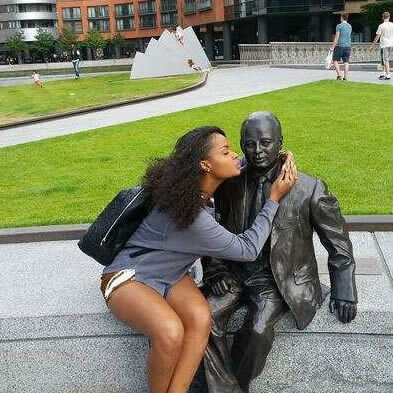 The former Big Brother Africa winner was about to kiss a statue when the picture was taken.